Some time ago a lady from a local nature conservation agency (naturskyddsföreningen) came by to make an inventory of the valuable trees in our village. She was especially pleased with the old lime trees (lind) in our garden along the road. In the past these trees were used for hamling, the regular removal of young branches to provide food for the livestock. Trees like these are valuable historical elements of the local landscape. Therefor the authorities are helping landowners to keep them in good health. Read more on the lime and other trees in our garden. Although our house is now over 100 years old there has never been a stairway balcony at the landing area upstairs. For safety reasons we built a temporary one when we bought the house in 2008. It took some time to decide on the construction method and a design which would fit the house. 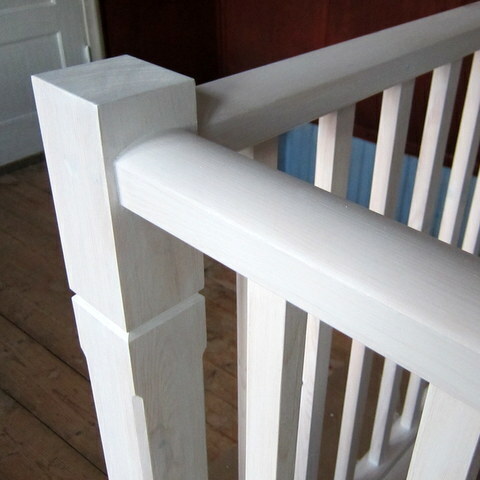 But over the past weeks we managed to replace the temporary railing of rough pieces of timber with a more elegant and solid construction. For more information have a look at our updated page about the upstairs hall. During the past weeks we have been renovating the gutter system of our house. We re-used the old materials as much as possible in order to retain the original appearance of the house. We are very happy with the end result, which you can see on this new page. Everything is now mounted properly at the right height, has the correct amount of fall, the fascia board have been painted fresh with lineoil paint, and the water is now flowing into the gutter instead of spilling over its edges. The paint of the back door had become dull, but otherwise appeared to be in good condition. I decided to halvolja it: freshen it up using a mixture of 50% linseed oil and 50% turpentine balsam. First, one has to clean the paint from dust and filth. Then you apply the lineseed turpentine balsam mixture. After fifteen minutes remove any access mixture that hasn’t been absorbed by the paint using a piece of cloth. Apply another layer after several days. Make sure you properly dispose of the cloths with linseed oil remains (either burn them or soak them with water) to prevent them from self-ignition. 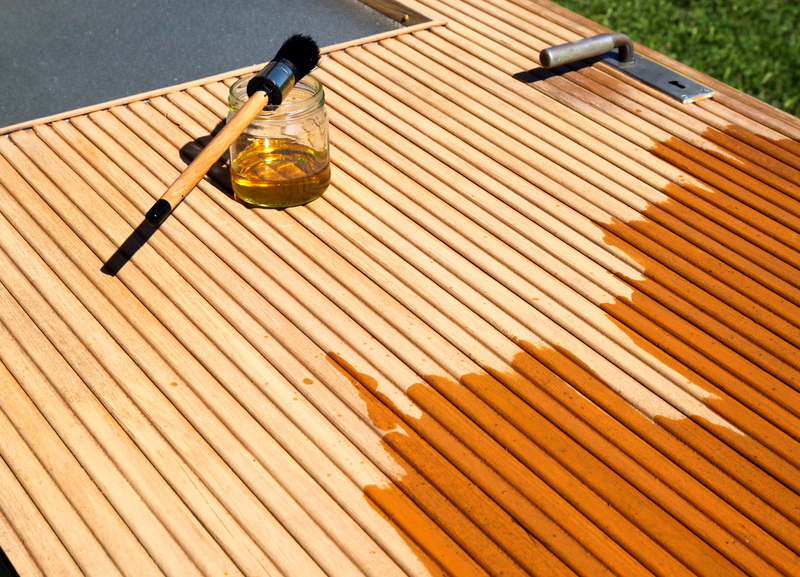 In order to avoid the growth of molds on the paint use a good quality cooked, cold pressed lineseed oil. After the halvolja treatment the paint almost looked like new and should again last for many years. An environmental and time friendly solution! Last week we have been renovating our veranda door. One of the double doors did not close properly and since the doors turn outwards the top and inside of the door get wet during heavy rainfall. Inspired by a short description in Så renoveras torp och gårdar we decided for a simple experiment to straighten the door again. After removing the window glass from the door frame (which we had to do anyway) we sliced a kerf in one of the door stiles at an angle of exactly 10 degrees, cutting two-thirds through the stile. Then we drove a wedge made of a solid piece of furu wood into the kerf after applying some outdoor wood glue. By experimenting with wedges of various angles we found out we needed one with an angle of 12 degrees to correct the door twist. 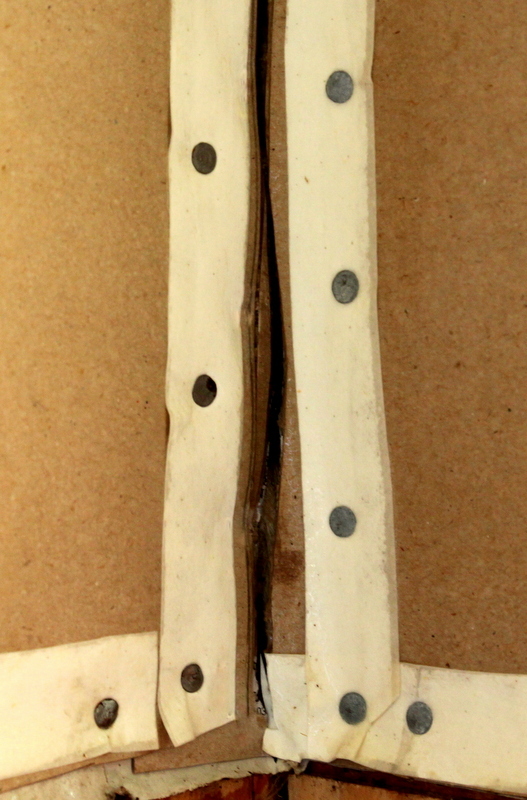 By using 2 strong woodworking clamps the amount of correction could be easily controlled. The end result is that the door now closes properly instead of the 15mm protrusion it used to have before the operation. The next job in the upstairs hall is painting the walls and then applying the stencils. 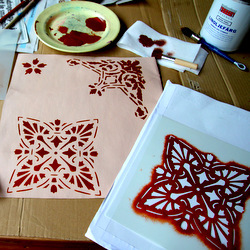 The quality of the painting of the original stencils was not so good so the drawings were irregular. Therefore, we scanned them and edited them in photoshop. Through a website we ordered professionally cut stencils made of mylar. Now we are practicing our stenciling skills: How much paint is needed? How to apply it? Swirling, tipping or stroking as usual? Practice makes perfect, but we should avoid it being too perfect, as the original was far from it. In our home-country, The Netherlands, we are used to walls and ceilings being covered by plaster. 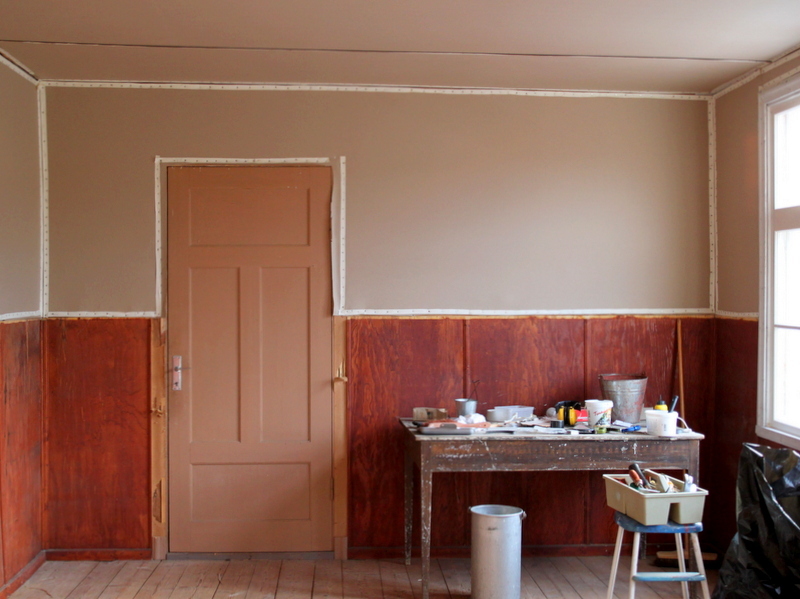 So for us one of the most remarkable traditional Swedish building techniques is pappspänning, the use of ‘stretch paper’ to cover walls and ceilings. With simple materials like paper, nails, water and glue one can turn a rough timber wall into a nice smooth surface. Our first attempt of pappspänning was the repair of the ceiling of one of our bedrooms, damaged by a leaking roof half a century ago. During the repair we got used to the materials and techniques. After this we went for a more serious challenge: an entirely new spännpapp for the ceiling in Helena’s room. Recently we have gained some experience when reconstructing the ceiling and wall cover of the upstairs hall. The page on spännpapp explains how it is done. The upstairs hall was last decorated in the 1940’s. The ceiling and upper parts of the walls were covered by spännpapp. The paper on the walls was decorated using stencils. Leakage from the roof led to severe damage of the spännpapp. Little by little we renovate this room into its original state. After preparations, such as removing hundreds of nails left over from the previous spännpapp, we started redecorating. Follow our progress on the upstairs hall. We had been looking for a while for a GSM remote control system to overlook our house while we are not there. Most of the remote switch and monitoring solutions available on the market are relatively expensive or have limited capabilities. We finally bought a GX107 from Conrad. It is very affordable and does everything we want. It has an integrated battery for backup power which lasts 120 hours and will continue to send its messages via SMS even when there is a power outage. The GSM signal is poor in our house but with the additional GSM antenna everything works great. So now we get messages on our mobile phone when the power is down, temperature in the ‘machine room’ drops below 4 degrees or when the house is on fire (not sure why that is useful, but we could at least ask a neighbour to go and have a look and call the fire brigade). Very useful also is the possibility to switch two power sockets, one of which we use for switching on the heater in our bathroom before we arrive at the house. With an additional master-slave remote controlled power outlet we can actually switch anything on and off inside (or outside) the house. You need to be a little handy to install the GX107 but it goes with a good set of instructions. In case you do not like a little fiddling with electrical wires there are obviously also plug-and-play system on the market, such as those from Ontech, which to us look like good value for money as well (but note we have not tried them). For us the GX107 does everything we need. And it was great fun to get installed, tested and up and running. While driving through the countryside one day, we noted an antique lågtryckspanna next to a house. We stopped and asked the owner whether he wanted to get rid of the machine. The owner, a bee keeper, had been using the steam kettle to clean and disinfect his bee hives but recently switched to using a modern dish washer. He was happy to give the panna to us and in an instance we had become the new owner of 100+ kg of old iron. We cannot find much information about our lågtryckspanna on the internet. They seem to have been used by the army in their field kitchens, to steam large quantities of food. There are some examples of modern versions of our steam kettle, e.g. “lågtryckspanna 101 MT”. Ours looks much older though, we guess it is from the 1930s or 40s. A neighbour told us that they used an old army lågtryckspanna to cook food for the pigs. Anyone familiar with the recipe? At home we tried the panna and it still worked great. It produces large amounts of hot water and steam. 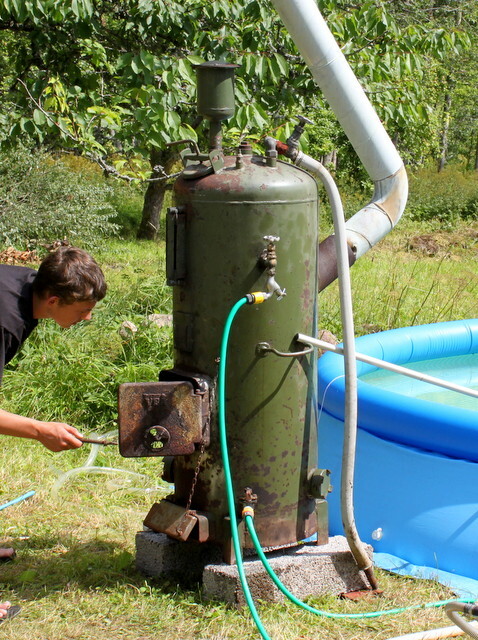 Since we had been looking for a smart and cheap heating system for our swimming pool this seemed a perfect solution. But we had not thought about the disadvantage of a steam kettle, particularly the enormous amount of noice (which is no fun next to a pool). See more on our pool page.